Wanna magnify the videos/pictures in your phone to a bigger screen and create a home theater ? 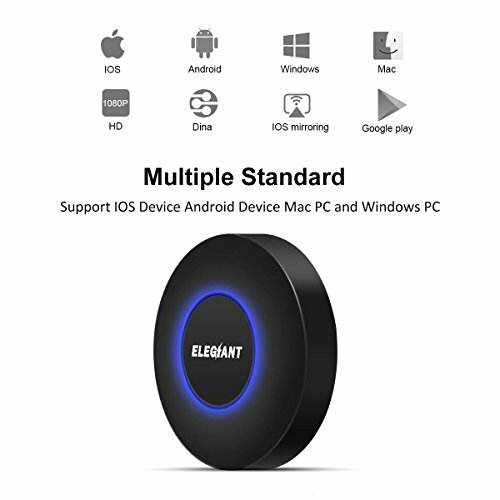 Make it possible with ELEGIANT Q1 WIFI Display Dongle without installing any APPs. 1. Support HDMI-1080P full HD output and AV/audio output. 2. Support multi-screen interactive features like DLNA/Miracast/Airplay. 3. External WiFi antenna for stronger signal transmission, the maximum transmission distance can be up to 5 meters. 4. Mini, small-size, lightweight, convenient. 5. Gorgeous breathing lighting effects. Use 5V/1A charging adapter to power on the dongle, then use the HDMI cable to connect the dongle to the TV or projectors. If your TV does not have HDMI port, you can use the AV adapter cable to make it work. Press the top button of the dongle to switch the mode. For iOS devices: Control Center> Airplay Mirroring> Choose the dongle (SSID:MONTOVIEW-XXXX, password: 12345678). Before mirroring, please connect the dongle to the WIFI router first. Open web browser> Visit 192.168.49.1 > Choose WIFI setup> Select your WIFI router> Input password> Connect. The dongle will show the SSID of your router and subordinate IP when it is connected to the router successfully. For Android devices: Please make sure whether your Android phone possesses Miracast function or not (You may find it in Control Center). If yes, turn on it and find the dongle (SSID:MONTOVIEW-XXXX). Select and connect. Please note that only if you connect to WIFI, can your phone and the dongle be paired. Please Note. Most negative reviews are due to the way of connecting it to WiFi, so if you do not know how to use it, please pay attention to "Product Description" part on the page. It cannot mirror videos from the apps that require copyrights such as Netflix/ iTunes/ Amazon Video/ HBO go/ Hulu Plus/ Honda Motor/ ESPN. Equipped With HDMI output, AV/speaker output, and LED indicator. Full HD 1080p output with faster processing speed offers you a perfect home theater experience. Multi-mode Selecting. It supports Airplay mirror/DLNA/Miracast and other intercommunication agreement, synchronously casting photos/videos/OFFICE files/web-pages/live camera from iPhone/Android Smartphones to tablet PCs, large-screen TVs, and projectors. Designed for home theater, video games, PPT presentation during the meeting and conference. It does not support Apps Miracat or Airplay. Your smartphones must possess the function of Miracast (Android devices) or Airplay (iOS device). Online Upgrading. PLEASE NOTE that it does not support 5Ghz WiFi. It will upgrade automatically when there is a new version on the dongle server only if there is a network connection. It can stream YouTube videos, but it is recommended to use the YouTube app before the version 12.45.13. currently. High-Tech & Mini Fashionable Design. It adopts RK3036 dual-core ARM Cortex-A7 1.2GHz chip, achieving faster processing. It can decode H265 format video, support WPS one-key encryption, and connect with router or AP configuration more quickly. The overall design is a mini round disk. Looks decent and cool with the LED lights on. Convenient to Use. No App or driver required. 3 steps to enjoy 1080p HDMI video on the large screen: Plug->Connect->Mirroring. Please follow the steps shown on screen, otherwise, it may not work. Please feel free to contact us when meeting any problems. Our customer service is always there and glad to help you out.